Ikuna is a ring of many small worldlets (planetoids AKA an "asteroid belt"), not capable of retaining an atmosphere or water, and nonindustrial in nature. It is a member of the Third Imperium in the Caledon Subsector of Reaver's Deep Sector in the Domain of Ilelish. The world is part of the Khakhan Track. Primary: Binary star system. Ikuna, spectral class F5IV. ICN S4G0809F5IV. Mass, 2.5 standard. Stellar diameter, 2.6 standard. Luminosity, 12 standard. Gakur, spectral class M0VII. ICN S4G0809M0VII. Mass, 0. 154 standard. Stellar diameter, 0.256 standard. Luminosity, 0.011 standard. Orbital radius, 5.2 AU. Planetary System: Eight major bodies. No inhabited worlds. Two gas giants in system. 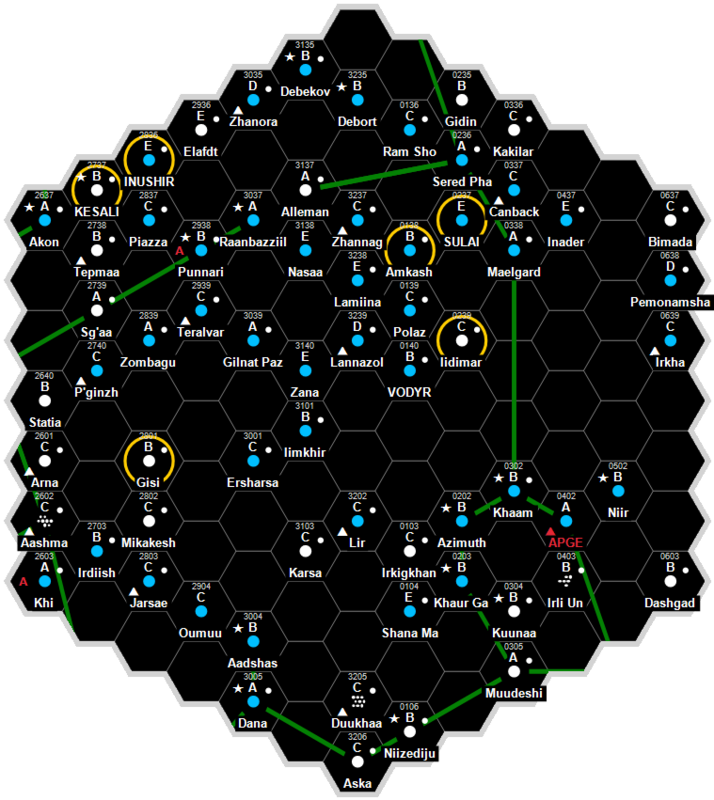 One planetoid belt (inhabited) in system. The Ikuna Belt: Mean orbital radius, 104.72 million to 134.64 million kilometers (0.7 - 0.9 AU). Ikuna starport mean orbital radius 127.16 million kilometers (0.85 AU). Period of LSP Management Facility, 175/7 days. Belt composition, primarily nickel-iron bodies of varying sizes. The Ikuna asteroid belt is a small and not particularly rich region in an unusual star system. The belt is located between the orbits of the two stars, Ikuna and its smaller companion, Gakur. Probably gravitational stresses between them created the belt; the remaining worlds of the system lie outside the orbit of Gakur, and are quite devoid of interest. In fact, the LSP operation at the Ikuna Belt is far larger than might be expected for an E-class port. The facilities at Ikuna are actually far more sophisticated; the belt easily qualifies for status as a class-A port, but LSP managers refuse to open the belt's facilities to non-LSP vessels. Visitors must make do with some primitive facilities located on the moon of the outermost gas giant, over 1,000 astronomical units out from the belt's orbit. Private vessels venturing closer to the belt without express permission are turned away by patrol cruisers crewed by tough mercenaries in the pay of the megacorporation. Ikuna has a pressure of less than 0.001 atmospheres, which requires the use of a vacc suit. This extreme concern with security has led to a great deal of speculation as to the "secret of the Ikuna Belt." Rumors abound; some of the most common include a rich minerals strike which LSP wishes to keep secret both from outside prospectors and from Imperial tax collectors; the presence of a secret testing area for new, high-tech ship designs; the discovery of an Ancients site filled with technological wonders, and many even sillier notions. The belt, of course, is big enough to make it difficult to police, and other ships could get in among the LSP-restricted belt. However, several incidents have occurred already in which intruders were destroyed without warning if they were found to have ignored the general signals restricting visitors from the belt zone. Whatever LSP is hiding in the Ikuna Belt, the corporation is determined to keep hidden. The Ikuna Belt is wholly owned by the Imperial megacorporation Ling-Standard Products, which bought all rights to exploit the star system from the Imperium 200 years ago. In addition to mining activities, the belt boasts several fairly large manufacturing centers, including an LSP starship plant specializing in the construction of planetoid-hull vessels. This page was last modified on 3 October 2018, at 08:05.